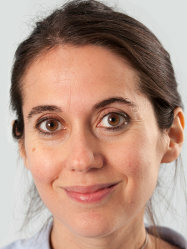 Professor Christina Fotopoulou is a consultant gynaecological oncologist at Queen Charlotte's & Chelsea Hospital. She was trained in obstetrics and gynaecology at the Charité University Hospital of Berlin with a sub-specialism in gynaecological oncology. Professor Fotopoulou was the leading consultant and vice director of the Clinic for Gynecology at the Charité in Berlin, one of the largest accredited centres for gynaecological cancer in Germany. She has also been the principal coordinator of the European Competence Centre for Ovarian Cancer, which was created in 2007 in Berlin. Her principal area of clinical practice relates to ultra-radical surgery for advanced and relapsed ovarian cancer and in general advanced gynaecological cancer. She is also trained in undertaking reconstructive surgery of cancer patients after cancer surgery. Among her research projects she has investigated the implementation of targeted therapies in advanced gynaecological cancers and their implications on surgical practice. She has broad experience in national and international clinical and surgical trials in gynaecological cancers and is involved in the German, British and European committees for guidelines development in ovarian cancer.